With wildlife photography, being at the right place at the right time is a key to success. Of course, being in the right place for a lot of time improves the odds. During this week, I spent time around groves of brilliantly-colored maple trees and on this morning a big bull elk obliged, summiting a distant ridge in the early morning sunlight. The bull was not in a hurry and, as you probably guessed, I captured a lot of images of it (at 9 fps). This image stood out to me primarily because of the elk's position. Its position in the opening gave it high contrast against the still-shaded background. 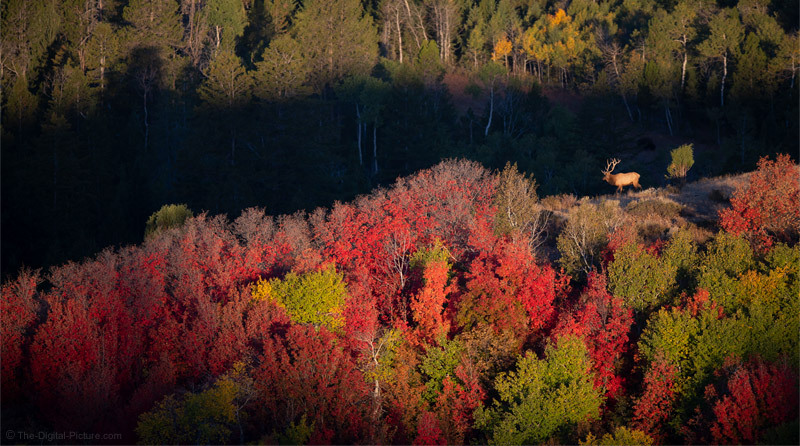 With viewers' eyes drawn to contrast, the elk is able to command attention over the brilliant red maple trees. The position of the bull's legs, all visible and showing movement, works well. The head angle is usually important and the slightly-toward-the-camera angle is usually a good one. Shooting at very long distances in direct sunlight usually results in significant heat wave distortion when using a high magnification focal length. Because the sun was just beginning to reach this area, the heat waves were not yet an issue and that problem was avoided.